Training Your Dog To Come When Called Is Very Important! Training Your Dog To Come When Called! Training your dog to come when called is probably the most important command you'll ever train your dog and it is also one of the ones that you really, really need to do successfully - each and every time. One of the simplest joys of owning any dog is the ability to go for a walk in the park, around your block or even in your own yard knowing that if you let him off lead to run or play that he WILL come back to you when you call for him. Dogs that do not respond to this most basic of commands are simply "prisoners of their leash". 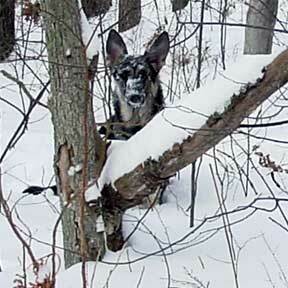 Even more serious, those dogs that don't come when called if loose are a danger to themselves and others. If your German shepherd simply doesn't come when called, you don't have a reliable dog and trouble is waiting to happen to you both. Think about it for a moment. Just how many potential dangers are there outside with your dog off leash? Automobiles, traffic, other loose animals, poisonous substances, etc. And I don't know about you, but I've yet to see a dog come out on top with an accidental meeting with any car. 1. This is really important! Teach your dog to come when called to you just as soon as you bring him home for the first time, no matter how old or how young he is. Start your relationship off the best way, right away. Training your dog to come when called should start right away. 2. Be really, really nice to your dog whenever your German Shepherd comes to you - each and every time. You want your dog to feel comfortable and happy whenever he comes to you. Probably the absolutely quickest way to teach your dog not to come to you is to call him and then when he comes to you, to punish him for something. Another example of unintentionally teaching your dog not to come to you is to go for a walk or run in the park and then to call him to you when it's time to go home. If you were to repeat this sequence over and over several times then you basically teach the dog that fun is over! Eventually the dog may become reluctant to come to you on its own when called by you because he isn't ready to stop playing yet. One way to prevent this kind of unintentional training is by calling him to you several times during any outing or play session, sometimes giving him a treat, sometimes just plenty of attention, sometimes give him a favorite toy and then letting them return to play again. In this way you're training the dog to come to you because they will be rewarded positively when they come when called. 3. Whenever you're not sure how your dog will react, simply keep your dog on leash. Better safe than sorry. Learn to read his body language, know your dog and be able to anticipate when he is simply not going to come to you. Training your dog to come when called should be a command you work on daily. You'll basically be tempting fate hoping your dog will come to you once he has spotted the neighbors cat, another dog or even a biker or jogger whenever he's outside and off leash. Resist the urge to say "Come" over and over to your dog because it will simply lose all meaning after a while and your dog may even learn to ignore you whenever it is off leash and you use the come command. Do not get angry, yell at or punish your dog once you have caught him either or he will become afraid of you and not want to come to you whenever you call him. Now you will be doing just the opposite of training your dog to come when called by making it not want to come to you because you just punish it or do something the dog considers negative. Instead, patiently go and put him on the leash and go about your way without punishing the dog you just caught. 4. Exercise cannot be overemphasized as far as your German Shepherd is concerned. Most dogs simply do not come when called because they just do not get enough physical exercise. It's simple but true. Whenever they do finally get the chance to run and play, they will probably run off and make the most of their time out by staying out for as long as possible. Each and every day your dog needs to exercise. The importance of dog exercise can't be overemphasized! If their energy is not used up, it will transform itself into other behaviors that you will probably not like, such as barking, jumping, chewing, digging or running away or not coming back when you call them. One of the best pieces of advise I can give you is to consider what your dog was originally bred to do, which will easily tell you how much exercise your dog really needs. In most cases, a few laps around the backyard is simply not enough. You will always need to actively participate in your dog exercise program. Remember that training your dog to come when called is probably one of the most important, if not the most important, commands that you should train your dog! Make sure that your dog learns this command and can perform it well each and every time and you will both be much happier. This one command could easily save your dogs life. Training your dog to come when called is really important.